One of the biggest successes from 2009’s COP 15 conference was securing funding for climate change adaptation and mitigation in developing countries. Donor nations agreed to “provide new and additional resources […] approaching $30 billion for the period 2010–2012, with balanced allocation between adaptation and mitigation.” They also committed to mobilize $100 billion a year by 2020. But the agreement left a key question unresolved: how should funding be “balanced” between adaptation and mitigation? Should the funding balance be 50/50 between adaptation and mitigation or should it based on each country’s needs? Should funding include both private and public sector investment? These are some of the questions that negotiators will need to address during COP 19 in Warsaw. But whatever they decide as being a “balanced commitment,” one thing is clear: finance for adaptation needs to increase in the coming years. The $100 billion climate finance by 2020 commitment was negotiated to “address the needs of developing countries,” but these needs often differ from country to country. For example, Least Developed Countries and Small Island Developing States need significant investments to deal with the impacts of climate change—to which they are particularly vulnerable—but probably require less investment for low-carbon development. 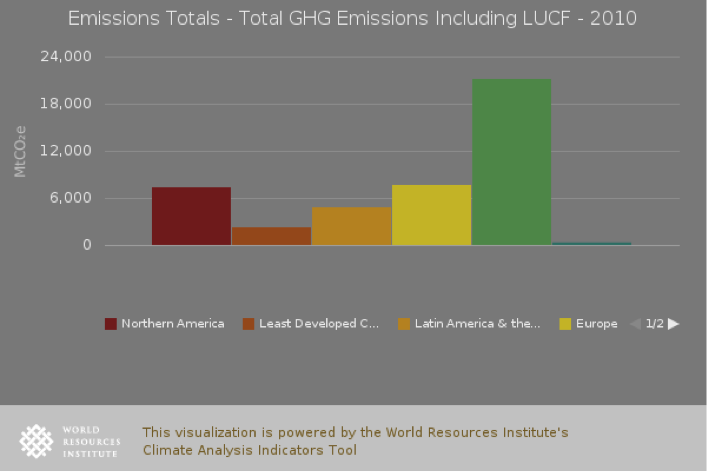 In 2010, these nations only contributed 6 percent of all greenhouse gases. The COP 15 agreement also stated that “funding will come from a variety of sources: public, private, bilateral and multilateral, including alternative sources of finance.” Developed countries have stressed the need to leverage private sector funding to reach their $100 billion commitment. Indeed, the Landscape of Climate Finance 2013 reports that the private sector plays a key role in funding mitigation activities. However, our knowledge of how the private sector can contribute to adaptation in developed countries is still limited. A Stockholm Environment Institute study suggests that, in general, private sector finance is unevenly distributed and often does not address the most pressing development needs. Also, because adaptation projects typically provide public goods - such as flood protection or increased resilience (through income diversification)—it can be hard to attract private investments. Among special funds tracked by the Climate Funds Update, 77 percent of funding goes to mitigation. At multilateral development banks 81 percent of funding goes to mitigation. And of all climate finance provided by OECD donors, 56 percent goes to percent to mitigation; 19 percent to projects combining adaptation and mitigation. No matter which way you slice public climate finance, mitigation earns the lion’s share and adaptation only gets a small bite. How Can We Achieve “Balanced” Climate Finance? A 50/50 commitment for adaptation and mitigation from public sources. This definition is the easiest to track from a global perspective. However, judging by recent data, developed countries would need to substantially increase adaptation finance to achieve a 50/50 balance. A 50/50 mobilization for adaptation and mitigation from public and private sources. Under this definition, public funding is used to leverage private sector funding, and both are included in the overall balance assessment. However, this introduces a large unknown: the private sector’s role in providing adaptation goods and services. As the Landscape of Climate Finance report makes clear, only scant information exists on private sector adaptation flows. We know very little about leverage ratios for adaptation funding, and it is likely that these will be lower than for mitigation. Furthermore, a survey of climate finance instruments shows that adaptation projects do not attract as much private sector interest. 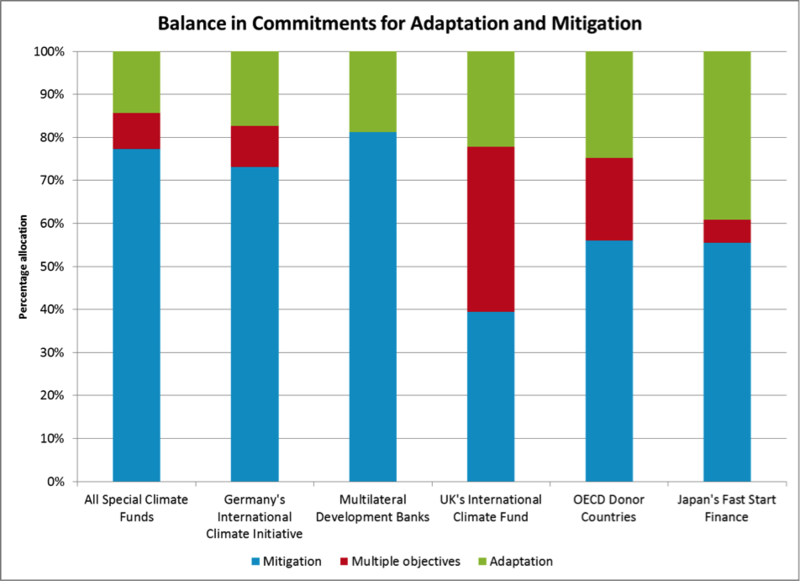 To achieve overall balance, a larger share of public funding should go to adaptation over mitigation. A balance based on needs. Climate finance needs differ substantially from country to country, suggesting that balance could be defined at the national level. Under this approach, climate finance would fund more adaptation projects for countries vulnerable to climate change impacts and provide more mitigation funding for high-emitting countries. This definition requires countries to express their needs for both adaptation and mitigation finance. Few countries currently do this, and it will be difficult to track at a global level. Every dollar invested now in mitigation means fewer dollars needed tomorrow for adaptation . Striking a balance across time instead of across portfolios is appealing in the abstract, but even that kind of balance would not remove the need for adaption. Even if we halt all emissions today, temperatures will keep rising, meaning we would still need to adapt to the impacts of climate change. Because adaptation needs are unevenly distributed across the globe, defining balance across time rather than geography could risk creating new inequities among countries. The global community must develop a definition of balance that ensures adaptation needs are not left unmet. Given this reality, negotiators should ensure balance between finance for adaptation and mitigation at national levels based on each country’s expressed needs. Global funds such as the Adaptation Fund, which is putting projects on hold because of lack of funding, and Green Climate Fund (GCF) can play an important role at the national level to ensure this balance. At COP19, negotiators will discuss the future of the Adaptation Fund and how much funding it receives. Using the Adaptation Fund to increase financial support for adaptation and ensuring the GCF has a robust funding window for adaptation are two good ways to restore balance at the country level. Balancing adaptation and mitigation is not easy, but it is important to facing the challenge of climate change. We know developed countries must increase their finance ambitions in order to fulfill their commitment to provide $100 billion a year by 2020. Ultimately, defining “balance” correctly is a critical step to meeting the world’s climate financing goals.